This year, the Down by the Laituri Festival takes place in Turku for the 27th time. Since 1988, the festival situated by the Aura river in the Turku city center has attracted both the young and elderly. This time, the spectacle presents itself under a new image: unlike in the previous year, the tent is not a circus tent but a huge festival tent, which provides more space but most of all, better ventilation. A second stage allows more artists to perform. In addition, the festival already starts on Tuesday with a Stand-Up Finlandia Show, which is well attended. Comedians such as Sami Hedberg, Jape Grönroos and many more make the audience laugh – some a little more, some a little less. Weather-wise, the weekend looks promising as the forecast predicts sunshine and temperatures from 27 to 33 degrees Celsius – on an area that gives only little shade but fortunately sends a gentle breeze from the river. We arrive on the site not until Wednesday and decide to take it slow due to the heat and a heavy flu that we both have caught right at the beginning of the festival. The gates open at 3 pm and while bands such as WRUM and Apulanta open the festival on the Telta stage, on the Ranta stage it´s Gangster of Love, who had already played at the festival in the previous year. In the audience, you can see some drunkards, a few of them being so obtrusive that the security staff has to remove them from the site and will probably not allow them to come back here for the following days. The band keeps focusing on their performance and dedicates one of their songs to Johnny Winter who has recently passed away. Next, a Finnish phenomenon takes the stage: Egotrippi . You either love them or hate them but if you see them in concert, you can tell that they love what they do. Along with their hits such as “Älä koskaan ikinä” or “Matkustaja”, they belong to one of the most famous bands in Finland. The audience celebrates the band around their somewhat idiosyncratic singer enthusiastically and sings along loudly. Overall, this has been a successful festival opening for us, that’s why we decide to skip pop singer Kaija Koo and will come back tomorrow for another long day at Down by the Laituri. On the Ranta stage, 90’s music is on the agenda for the rest of the evening. 90’s parties are in and in the Northern countries in particular where stars like David Hasselhoff make regular appearances. At Down by the Laituri, you can meet two black artists who have shaped the Eurodance scene of the 90’s like no one else: Haddaway and Dr Alban. First, the Dutch native Dr Alban is taking the stage and announces that he will have to check the monitor first. After a great deal of discussion and chitchat with the audience, the first song finally starts – during which he finds a fault again. While his guest back vocal singer remains professional and is trying to make the best of the situation, he totally flips out and even interrupts his big hit “What is love?”. The audience is stunned by this joke. The conclusion from this evening: An annoyed singer, an amused audience and an ageing 90’s star who is leaving the stage by throwing his microphone on the floor. With a twenty-minute delay, the audience in front of the Ranta stage gets to listen to heavy rock tones. Ahola are entering the stage. The band founded around singer J. Ahola, who has become one of the most wanted metal artists in Finland in recent years, deliver a show of Vintage Rock (as they call it) with the use of full physical strength. Without much interaction with the audience, they are playing songs from their new album “Tug of War” as well as from “Stoneface”. For each guitar fan, Antti Karhumaa is throwing out a few tricky guitar solos. A great performance that ends all too soon! Next are gonna be four gentlemen who have become indispensable in the Rock scene. They spread joy and happiness and get you into the party mood. I am talking about Reckless Love . 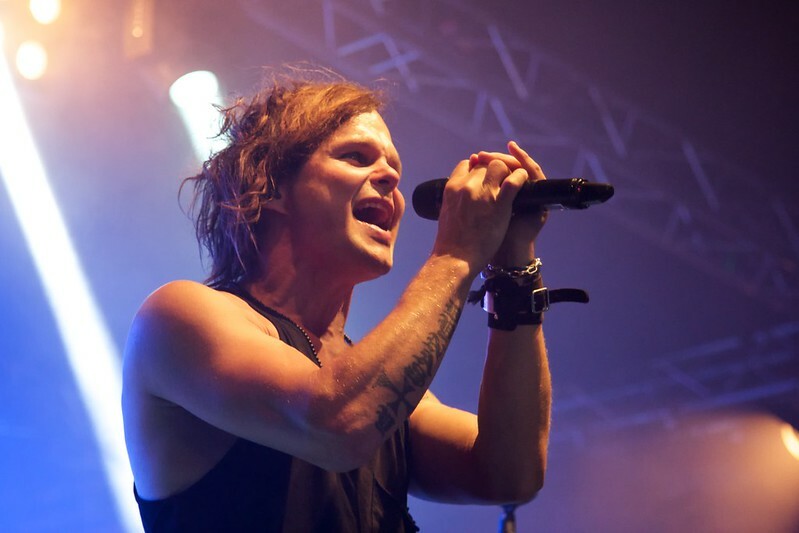 The band around singer Olli Herman knows exactly how to captivate its audience. To me, this band is a phenomenon over and over again. You simply enjoy watching and listening to these guys. Not a bad performance; they appear highly professional. I think if they keep going this way, they will stay in business for a long time. I have been waiting for this act for years: Lauri Tähkä! He also belongs to one of these artists you either love or hate. I belong to the first category. I could just go into raptures as this gig at Down by the Laituri has been one of best gigs I have ever seen in my life – and trust me, I have seen plenty. The power and joy generated by the entire band is being transferred to the audience. You see many couples dancing to Tähkä’s songs even though there is a hustle and bustle in front of the small stage. Lauri delivers a good vocal performance and jumps on his piano so that he can be seen by everyone. In addition, he does a few spectacular stunts during the gig. He always keeps close to the audience, which I would not have expected from him since he belongs to one of the more successful artists in this business. Nonetheless, he does not consider himself above the audience, so he climbs over the barriers and seeks close contact with his fans. Very likeable, a perfect performance and definitely worth seeing another time. Simply great! Numerous events are taking place in the clubs around the city center. While Elonkerjuu – who used to play with Lauri Tähkä – are playing at night club Vegas, Rock & Roll Sensation are taking the stage at Apollo two nights in a row. Today we decide for a short day, so I arrive on the site only before Lovex are taking the stage. Unfortunately, the Pop / Rock band from Tampere do not manage to win over their audience; just the right mood does not come with them, partly because singer Theo goes out of sync and focuses too much on his stage acting. What a pity, since these guys actually have strong potential. However, they should work more on their stage performance. Conclusion: Down by the Laituri is a small, family-friendly festival, which is well organized. The organizers take criticisms to heart and try to fix problems as quickly as possible. The team really organizes something great here and it would be a pity if it ended after all these years. Thus, let’s hope that there will be another “Rakkauden Festivaali” at Down by the Laituri next year.